Less than a mile across in some places, the Detroit River was a haven for bootleggers during Prohibition, as boats would ferry liquid cargo from "wet" Canada to "dry" America. Today, the shipments could be heading in the other direction, thanks to David Landrum and Peter Bailey, the entrepreneurs behind Two James, the first distillery in Detroit since the 1920s. 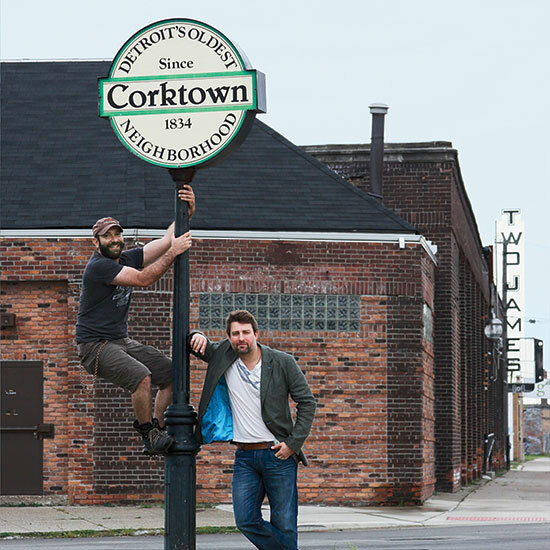 The longtime friends, who named their company after their dads (both called James), are making small-batch spirits in a former doughnut factory and taxi-repair shop in the Corktown neighborhood. (A tasting room, located in the distillery, serves cocktails and sells bottles.) Distilled with lots of juniper and other botanicals, the duo's London dry gin is inspired by Bailey's father, who grew up above a pub in England. "Wild juniper grows like crazy here, but no one cultivates it. Now we've found some people who are willing to plant it for us," says Landrum. Their rye whiskey, currently in barrels, is made with 100 percent Michigan-grown rye and was inspired by Landrum's dad, who was born in Kentucky.